As the Christmas entertaining season approaches and we prepare to open our homes up to guests, it’s the perfect time to spruce up your interior and breathe new life into favourite spaces with clever combining of french antique furniture. 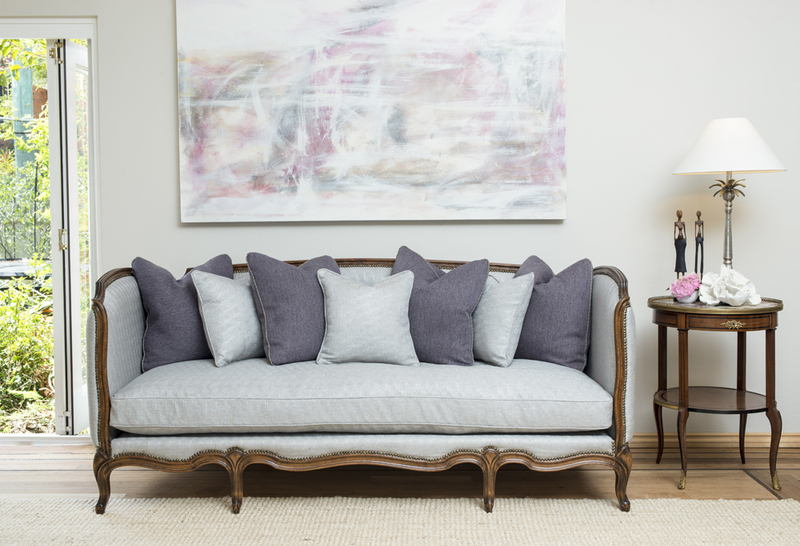 Here are six fabulous rooms built around statement french antique furniture pieces, guaranteed to make your guests feel right at home. Sometimes the smallest spaces can make the biggest impact – often with minimal effort. 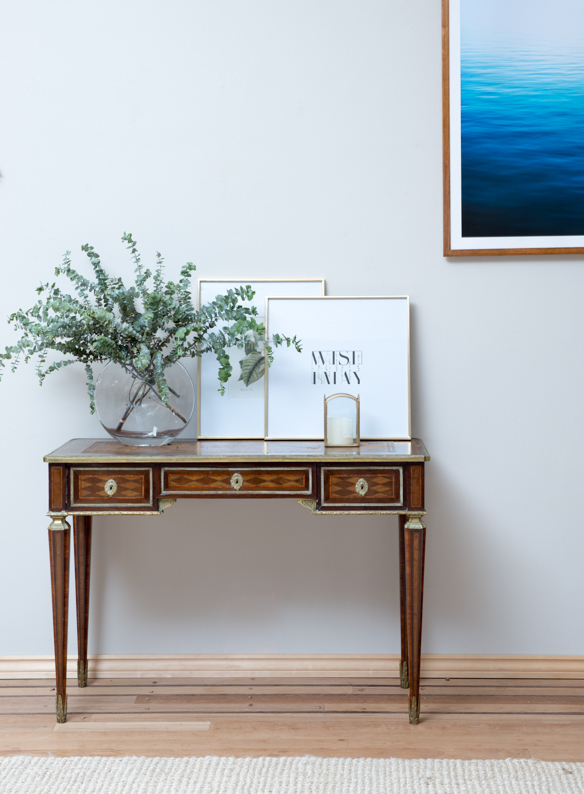 Add some personality to an entrance hallway or study nook by investing in a quirky piece like this 19th Century French parquetry and brass writing table. Accessorise with modern homewares and a touch of greenery. Click to view antique side tables. Or take a beautiful little pair of 19th century Italian walnut stools, to spruce up that otherwise difficult to decorate hallway or vestibule. Inject a touch of timeless gallic style into your living room with this magnificent pair of 19th century French Louis XVI mahogany and ormolu commodes. 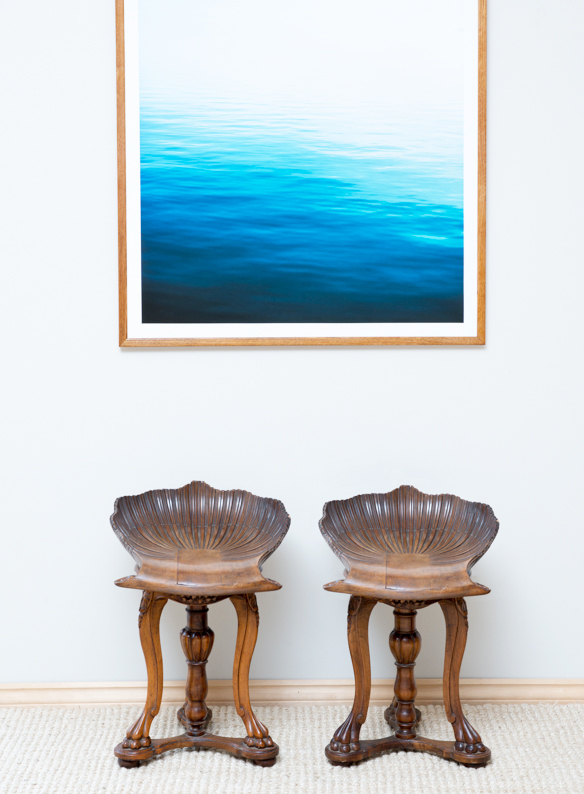 Team them with a contemporary artwork and lamp to re-inspire your room. Click to view our collection of commodes. … or take a 19th Century Louis XV day bed, reupholstered with Zepel fabric and paired with a late 19th Century mahogany, brass and marble gueridon. We love the contrast between old and new created by pairing classic antiques with modern artworks, as has been done here using the abstract hues of ‘Morning Light’ by acclaimed Brisbane artist Banx. Click to view day beds and gueridon table. Make your room a conversation piece in itself with this beautifully-constructed 19th Century English mahogany drum table with leather top. An unlikely and whimsical centrepiece featuring contemporary bird sculptures by English sculptor Martin Scorey is the perfect foil for the formality of the table which is relieved entirely by the other pieces placed alongside it. Likewise, the choice of a 19th Century French bookcase which has been stripped and bleached counterbalances the other antique pieces in the room, which include a pair of exceptional quality Louis XVI carved fauteuil armchairs. 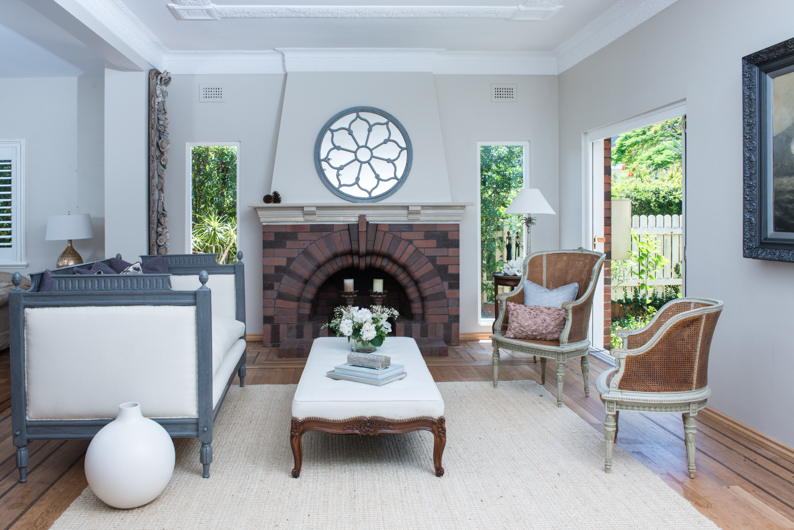 Transform a staid sitting room by mixing antique pieces in contrasting styles and finishes. 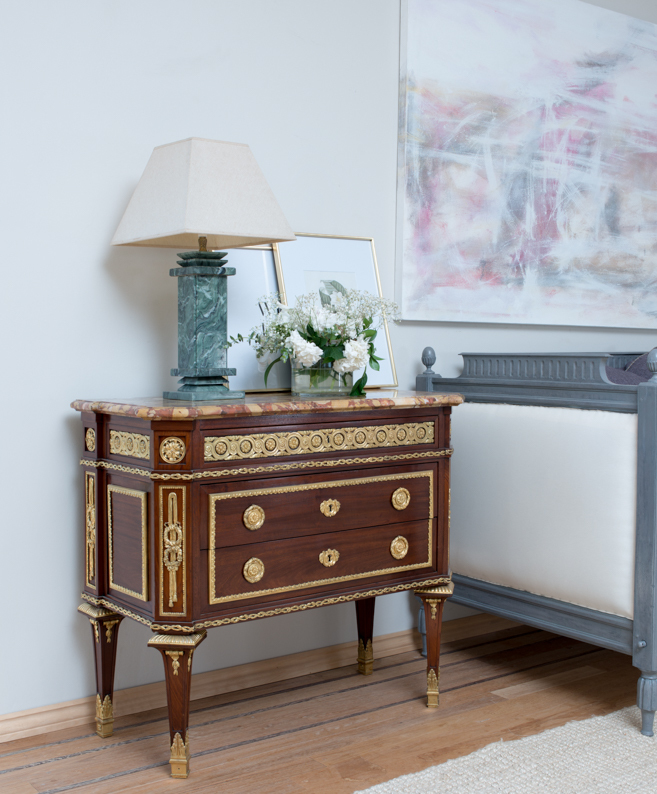 Here, an English ottoman in walnut sits alongside a French Louis XVI duchesse brissee and French 19th Century decorated canope. 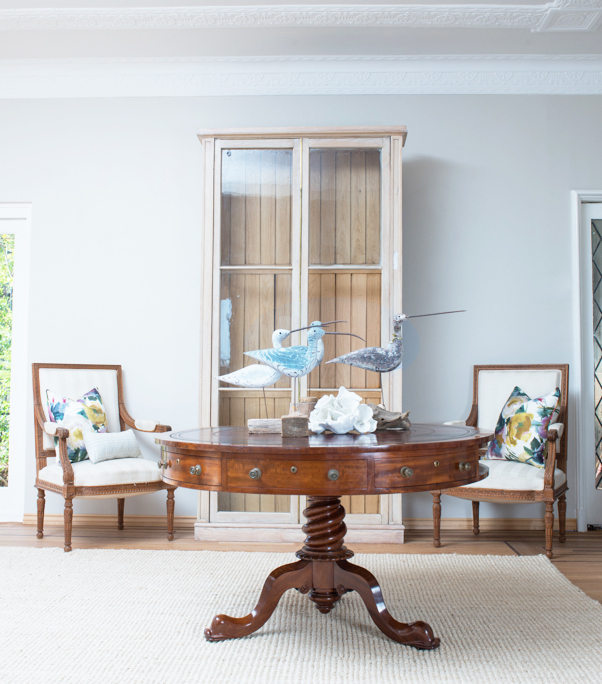 It’s all pulled together by a fabulous 19th Century French iron window which has been converted into a mirror. For more information about any of the french antique furniture featured, contact Wallrocks.